"To accommodate bicyclists, a minimum effective clear shoulder width of 4 feet should be provided from the outside edge of the rumble strip groove to the outside edge of the paved shoulder, or 5 feet from the outside edge of the rumble strip groove to the front face of barrier (including curb) or guardrail. 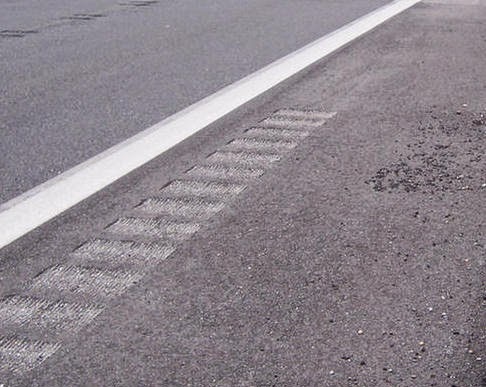 Rumble strips should be discontinued 50 feet before and started 50 feet after when adjacent to guardrail where there is less than 5 feet between the outside edge of the rumble strip and the face of the guardrail." According to DelDOT, nearly 50% of fatalities in Delaware are roadway departure crashes. A new initiative requires systematic safety upgrades (in this case, rumble strips) to the types of roads that certain crashes are occurring on, rather than focusing on individual crash hot spots. DelDOT's construction section and the contractor have gotten off to a fast start on this project and have already installed rumble strips on many miles of roadway. So far, the results are a degradation to the comfort and safety that our uniquely shouldered roads have to offer bicyclists, that untold thousands have enjoyed for many, many years in Delaware. 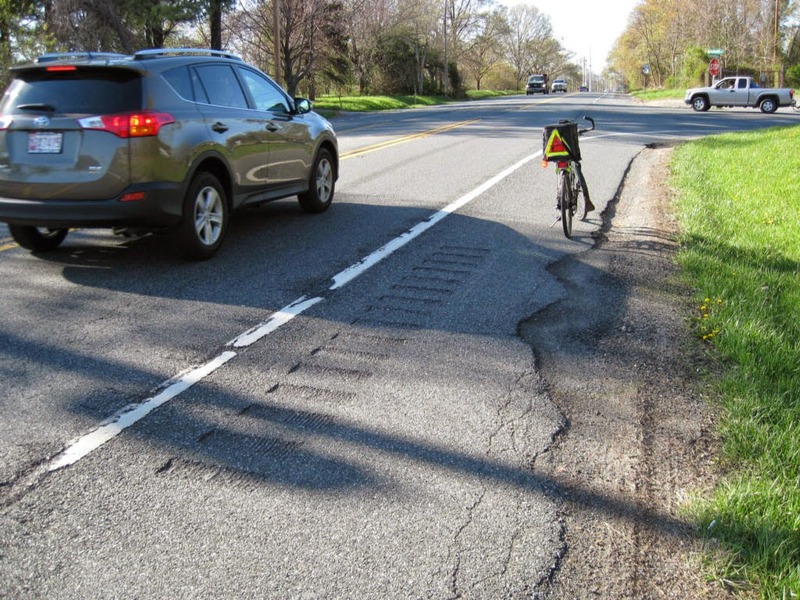 Why has this happened, despite DelDOT's choosing of "Bicycle-Friendly" Rumble Strips? It's all in the consideration of placement and design. Below, in pictures, we will make the case for why we believe the design guidance must change. Failure to do so might cost Delaware its prestigious Top-10 ranking as a Bicycle-Friendly State. 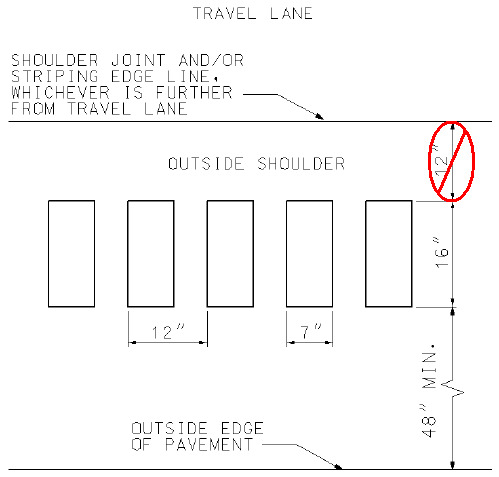 This recent application on Route 72 in Bear violates the guidance, in terms of 4' feet remaining between the rumble strip and the outside shoulder edge. DelDOT has acknowledged that errors have been made, and this will be repaired. The current DelDOT guidance calls for a 1' wide rumble strip, as well as a 1' offset to the white line. Effectively, this removes 2' of comfort zone from the shoulder, which may not be a big issue in rural areas that have wider shoulders and significantly less traffic. However, in New Castle County - where debris collection is a chronic issue - the safest position is usually the left half of the shoulder. This creates a dilemma for bicyclists, especially those with road bikes trying to protect their tires from sharps. The 1' offset to the left of the rumble strip, or the lane itself will likely become the more attractive option, placing them immediately adjacent to high speed traffic. This very unbike-friendly rumble strip on Route 273 in Cecil County - with no escape breaks - has many bicyclists now riding in the offset or in the lane, instead of in the shoulder. 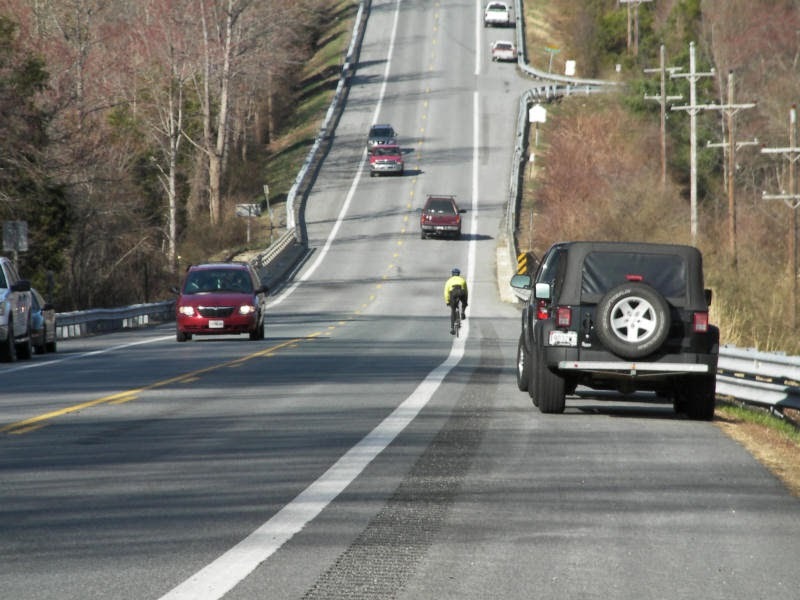 At the behest of Delaware advocates, Maryland's State Highway Administration moved quickly to revise its guidelines, to ensure this design is not repeated. 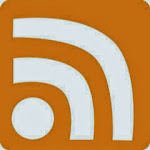 A history of that advocacy effort can be seen HERE. If they were to cut rumble strips on Otts Chapel Road in Newark, bicyclists would either ride in the debris, ride in the offset, or be forced to take the lane. And this is a very fast road, with speeds in access of 60 mph. You can clearly see where the cleanest section of shoulder is; the leftmost 1/3 or 1/4. Not all roads are this bad, but varying debris in the middle to right portion of the shoulder is common, and unsafe to ride in. Quite possibly, not having rumble strips is what has allowed us to forego sweeping, because the area that will now be occupied by rumble strips is generally clear. If they are going to commit folks to bicycling in the shoulder - which is normally the case when riding on higher speed arterial roads - then the full width of the shoulder must be maintained. 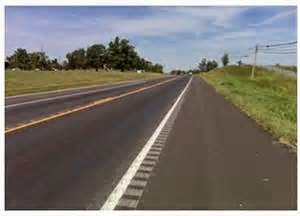 A possible compromise involves placing the rumble strip as part of, or on the white line. A number of other states, including South Carolina (below), Minnesota and Ohio already incorporate this design. 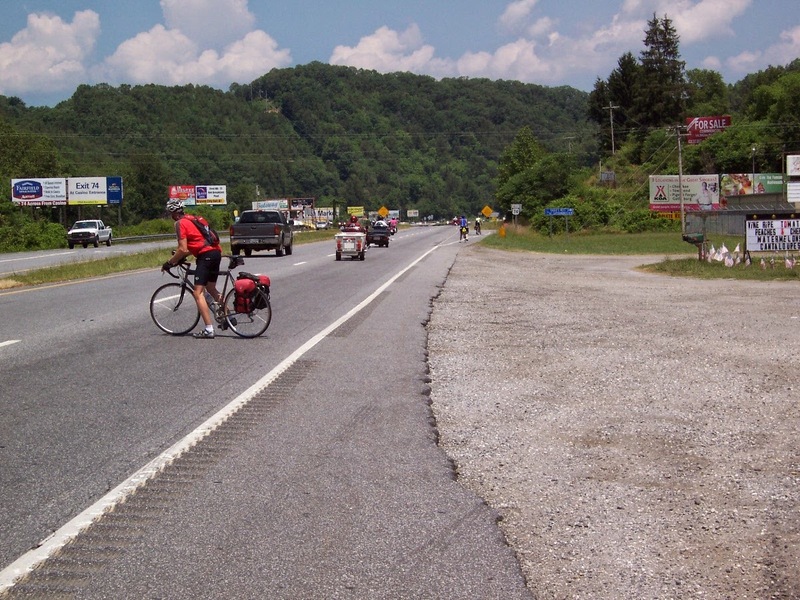 Rumble strip placement 1' outside the white line robs critical space needed to ride clear of debris, whereas placing it at the white line (as seen above in S. Carolina) preserves most of the shoulder. Another example of a white line rumble strip (whereabouts unknown). 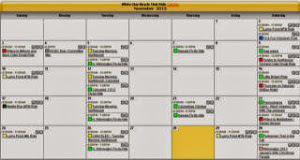 Further examples can be found in the MN and OH links above. White line rumble strips have an advantage for motorists, in that they give early warning and also increase the visibility of the edge line in dark or stormy conditions. Many bicyclists have adapted to bicycle-friendly white line rumble strips, citing their presence as an audible incursion warning system. Motorist lane drift is readily apparent to anyone who bikes for transportation in this era of electronic devices and lax law enforcement. White line rumble strips should begin to sound as the motorist drifts from the shoulder, not after. 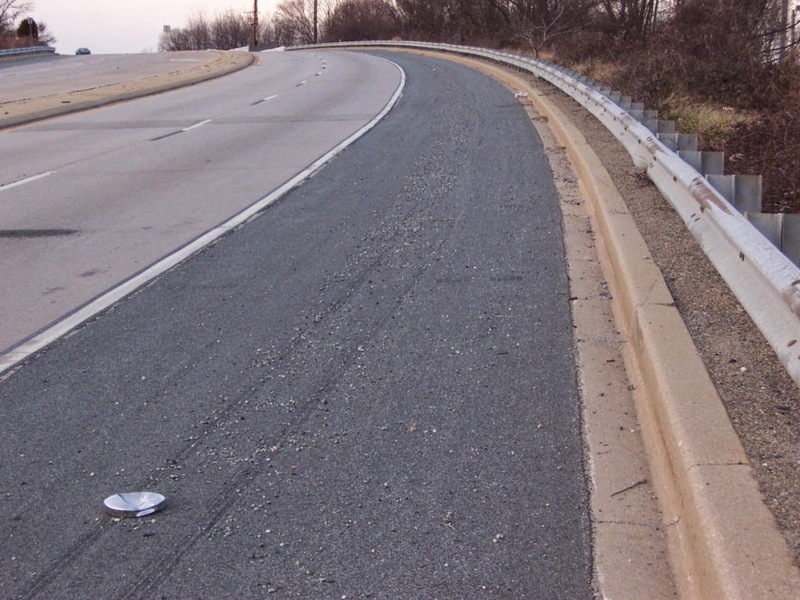 This 1' offset that DelDOT currently employs (between the white line and rumble strip) is enormous; by the time a car begins to traverse them, they are already well in the shoulder and could strike a bicyclist of pedestrian. We strongly encourage DelDOT to re-think its current rumble strip policy and guidelines, to preserve maximum shoulder space while helping to protect the vulnerable from vehicle roadway departures. 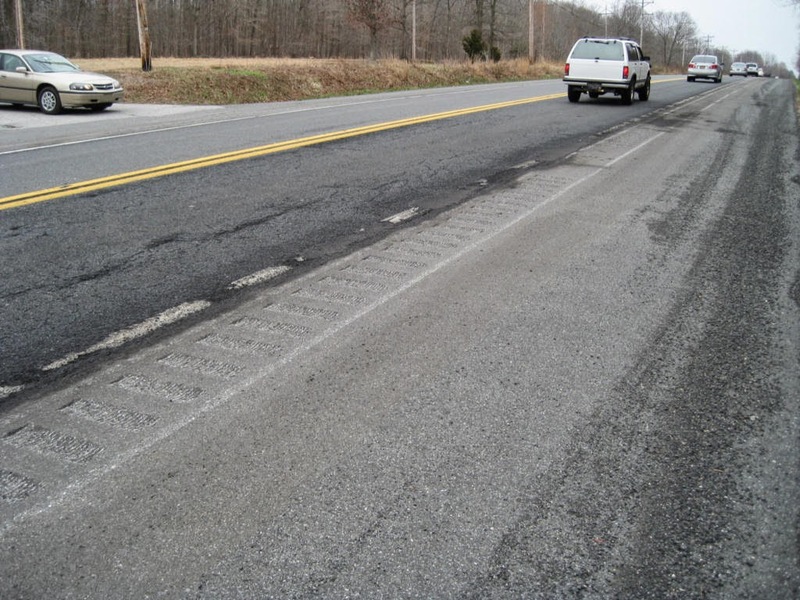 According to the FHWA, rumble strips with no offset are most effective at reducing crash rates.